I love to play with different compositions in my Cityscapes. 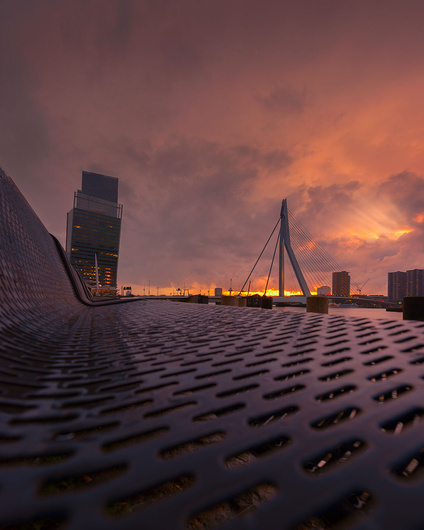 This is one at sunset at Rotterdam City Holland. I see what you were going for here and I like the attempt, but there are a few things that bother me. Without focus-stacking a bunch of images, there is no way you were going to get the foreground bench to be in focus with the background of the city, or even the ground visible through the bench. The fact that I can see the ground debris in focus while the bench surface is not is very distracting. Maybe if the ground below the bench had been in shadow and thus, invisible, it may have made a difference. There is a lot going on at the horizon. You've got several buildings, a bridge, a river, a boat or two, construction crane, spires of all shapes and sizes, bollards along the river edge ... it's just too much. I'm not sure hw this could be fixed in post, and maybe it can't, but I wanted to point out that it's all a distraction. As usual with any kind of architectural elements, I would prefer to see all the vertical lines of the buildings perfectly vertical with a perfectly horizontal horizon. I do love the sun rays poking through the clouds and I wonder if a more interesting shot would have been those clouds in the background with the bridge structure dominating the foreground.I've never been here, so I don't know the layout of the area, but maybe you can revisit and see what you get? I like the industrial feel that I get from this photo. I'm new to photography and still learning a lot. Phillip had a good point about the horizon and there are always choices to be made when we press the shutter button.